How much is the average American in debt? Debt truly is a four-letter word for many Americans. It can lead to stress, sleepless nights and fighting in relationships. It can force you to live paycheck to paycheck and prevent you from getting ahead financially. Because debt is such a widespread problem in the U.S., GOBankingRates set out to uncover why Americans are in debt. 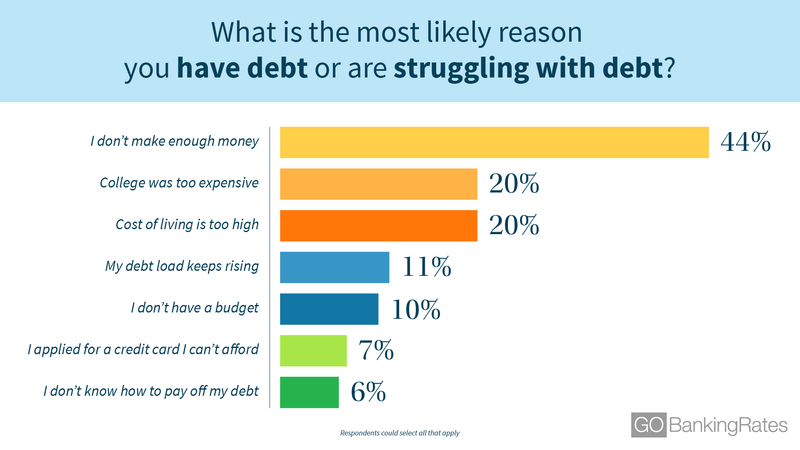 More than 5,000 adults were surveyed to find out how much debt they have, when debt became a burden in their lives, how they deal with debt and how their lives would be different without debt. Keep reading to find out how and why Americans are drowning in debt. Household debt in the U.S. is at an all-time high of $13.29 trillion, according to the Federal Reserve Bank of New York. That’s $618 billion higher than the previous peak of $12.68 trillion in 2008 during the Great Recession. The biggest contributor to the rise in household debt is growing mortgage debt, which is $9 trillion as of the second quarter of 2018, according to the New York Fed. The second biggest source of debt in U.S. households is student loan debt, which is $1.4 trillion. The GOBankingRates’ survey found that the average debt among the more than 5,000 adults it polled is $52,458. Men tend to have a bigger debt burden, on average, than women — $55,081 versus $50,124. And adults ages 35 to 44 have the highest average debt of all the generations — $68,234 — followed by adults ages 24 to 35, with $58,217. 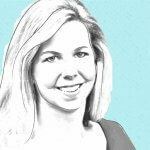 Women are more likely than men to blame their debt on low income. The survey found that nearly 48 percent of women said they are struggling with debt because they don’t make enough money compared with about 40 percent of men. Unfortunately, this isn’t surprising — another GOBankingRates’ analysis found that women earn less than men in every state. However, it is somewhat surprising that older generations are more likely to claim that they are struggling with debt because their income was too low. Americans’ peak earning years tend to be in their late 40s and early 50s. But older adults ages 45 to 54 had the highest percentage of respondents — 50 percent — who named low income as the reason they have debt, followed by 48 percent of adults ages 55 to 65 and adults 65 and older. Income stagnation might be one reason why such a large percentage of Americans say their debt burden is a result of low incomes. The average hourly wage has increased since the Great Recession, but real wages adjusted for inflation have barely budged. The survey found that the majority of Americans become burdened by debt at a young age. More than 50 percent of respondents claim that debt became a burden in their lives before age 35. In fact, 30 percent said debt became a burden for them before age 25. Q: At What Age Did Debt Become a Burden in Your Life? Men are much more likely than women to say that debt became a burden for them between ages 18 and 24 — 37 percent versus 23 percent. But it’s not necessarily because they’re carrying a bigger student loan debt burden. Women actually hold two-thirds of the outstanding student loan debt in the U.S., according to a report by the American Association of University Women. However, the high level of student loan debt overall in the U.S. might explain why the majority of survey respondents said debt became a burden in their lives before age 35. Housing debt also plays a big role because the median age of first-time home buyers is now 32, according to the National Association of Realtors. The survey found that the debt Americans want to get rid of most is credit card debt, with nearly 33 percent naming this type of debt. Adults 65 and older actually had the highest percentage of respondents who said they wanted to get rid of credit card debt — 47 percent. However, Gen X has the highest average credit card debt among the generations, at $7,117 per consumer, according to data from TransUnion. In the GOBankingRates survey, about 34 percent of respondents in this generation said the debt they want to pay off most is credit card debt. Overall, student loan debt came in a close second. About 27 percent of all respondents said student loan debt is the debt they want to get rid of most. Mortgage debt is the third most common debt respondents want to tackle, followed by medical debt and auto loan debt. Women are more likely than men to say that the debt they want to get rid of most is credit card debt — 36 percent versus 30 percent. Men, on the other hand, are more likely to name student loan debt — 31 percent versus 23 percent. Not surprisingly, young adults ages 18 to 24 have the highest percentage of respondents who said they want to get rid of student loan debt most — 70 percent. However, research by Experian found that Gen Xers actually have the highest average student loan debt at $39,802, followed by baby boomers with $36,246. Debt is likely holding many people back from improving their financial situation. The survey found that 42 percent of respondents would save more for retirement if they could eliminate their debt. That would certainly be a step in the right direction, considering that the GOBankingRates’ 2018 Retirement Savings Survey found that the same percentage of Americans — 42 percent — have less than $10,000 in retirement savings. Plus, there’s a large percentage of people who need to replenish retirement savings that they have raided. Among those who have made early withdrawals from retirement funds, 44 percent did so to pay off debts and bills, according to a separate GOBankingRates’ survey. Baby boomers are the most likely of any generation — with 55 percent — to say that they’d save more for retirement if they paid off debt, followed by adults ages 45 to 54. And women are more likely than men to want to make saving for retirement a priority after paying off debt — 44 percent versus 38 percent. After saving for retirement, traveling more is the second most common thing survey respondents said they would do after paying off debt. Millennials are the most likely of any generation to choose this option. However, traveling wasn’t the top choice for millennials. Investing more money was the most common thing millennials said they would do if they could eliminate debt. Across all age groups, investing more was the third most popular option. Starting a family is the least common thing people want to do, with just 7 percent choosing this option. The good news is that a majority of respondents — 71 percent — are hopeful that they will get out of debt. Men are more confident than women — with 76 percent saying they think they’ll get out of debt compared with 67 percent. And millennials ages 18 to 24 are the most optimistic of any generation, with 86 percent of this age group saying they expect to get out of debt. 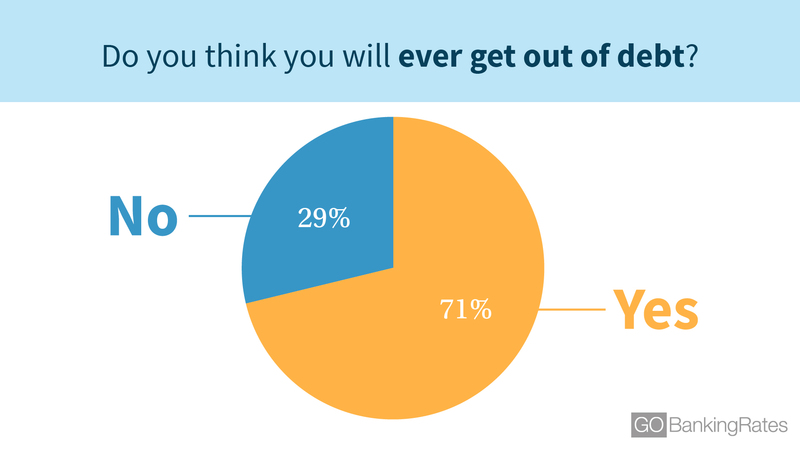 However, 29 percent of respondents overall think they’ll be in debt forever. Baby boomers and adults 65 and older are even more pessimistic, with 34 percent of respondents in both age groups saying they don’t think they’ll ever get out of debt. Unfortunately, this sort of mindset might play a big role in why some people get stuck in debt forever. If you believe that debt is an essential part of life, it can be hard to find motivation to pay it off. Of course, not all debt is necessarily bad debt. Mortgages and student loans can be good debt because a home can grow in value and an education can pay off over time through higher earnings. But high-interest debt such as credit card debt should be tackled quickly to reduce the total amount owed and to free up more cash for other financial goals. If you’re willing to cut costs, find ways to make extra cash and budget carefully, you can dig yourself out of debt. Methodology: For this survey, GOBankingRates polled 5,003 adults on Oct. 9, 2018 and asked the following six questions: 1) Of the following, what is the most likely reason you have debt or are struggling with debt? Select all that apply. 2) Which type of debt would you like to get rid of most? 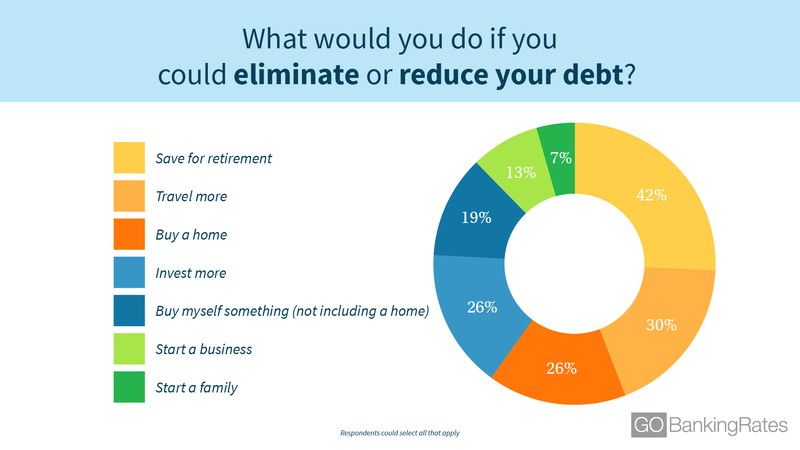 3) What would you do if you could eliminate or reduce your debt? Select all that apply. 4) Do you think you will ever get out of debt? 5) To your best estimate, how much total household debt (mortgage, credit card, student loan, auto & medical debt) do you currently have? 6) At what age did debt become a burden in your life? From student debt to retirement savings, see how you compare.